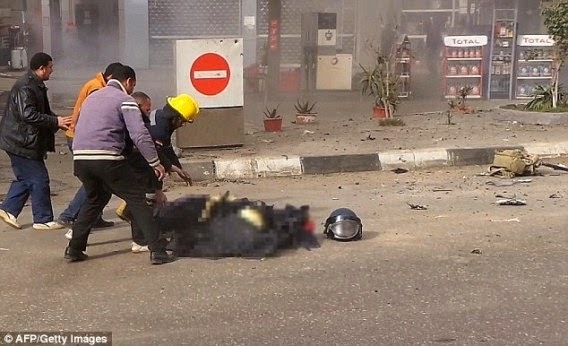 The right pic was taken a few seconds after a brave Egyptian police officer was killed while trying to defuse a bomb left outside a petrol station on a busy road in Cairo, Egypt yesterday. 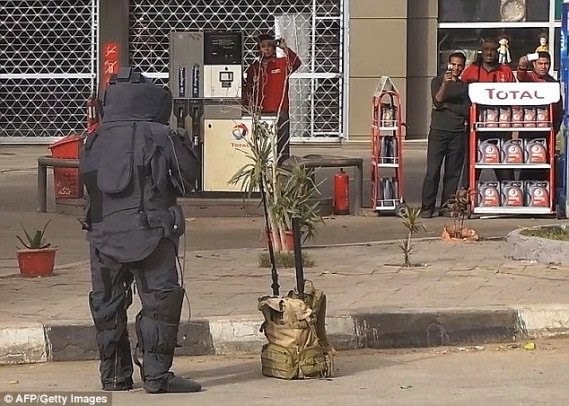 The officer, dressed in protective gear (left) was filmed on mobile phone as he approached the bomb and filmed also as the bomb exploded in his hands a few minutes later (right). Passersby rushed to his side after the explosion but he was already gone. A terror group named Ajnad Misr (Soldiers of Egypt) later claimed on Twitter that they were responsible for the attack and had been targeting police officers at a nearby station. These photos were shared on Twitter.